The Royal Albert Hotel and Modus Operandi seem to be getting on rather well. 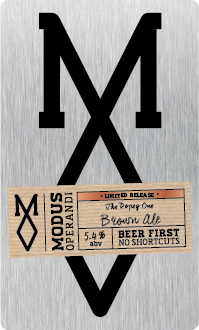 The former has been pouring one or another of the latter’s beers almost every day since MO started exporting beyond Mona Vale and into Sydney proper. The Albert is also the only place outside the brewery to have one of Modus’ infamous CANimal machines behind the bar. If it wasn’t clear that these guys are already BFFs, they’ve now gone and made a beer together which, in brewing terms, pretty much means they’re going steady. The product of their consummation is a fine brew named The Dopey One. After the initial idea of a saison was vetoed, they came to a consensus on an American brown ale. Brewer DJ came up with the base recipe, a few little twists were added and the RAH team travelled up the coast to get their hands dirty brewing it. They weren’t keen on a hoppy brown ale - in the end only a shade over half a kilo of hops were added - but went to town with the malts, adding somewhere in the area of nine different kinds. That’s created a beer low on bitterness but rich in other areas. The chocolate characters in particular, along with the late addition of coconut and vanilla, mean it offers up dessert-like flavours, though tending far more towards being dry than sweet. All up, it’s a very smooth, very easy-drinking brown ale that leaves its flavours to linger long. On this evidence, these guys should brew together more often.